The story of how 19 organizations are working together across sectors and differences to steward a 500,000 acre region. How to identify and address the root causes of problems rather than just mitigate the symptoms. Choosing the right software stack for your collaboration or network is essential. Here are our recommendations. Participants in a large, complex collaboration can build a capacity for finding common ground — and it doesn’t have to take years. 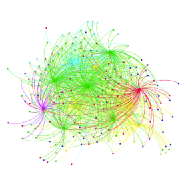 How SNA can be used to catalyze collaboration and increase a group’s collective self-awareness. Network entrepreneurs are ensuring that systems-level, collaborative efforts not only succeed, but thrive.